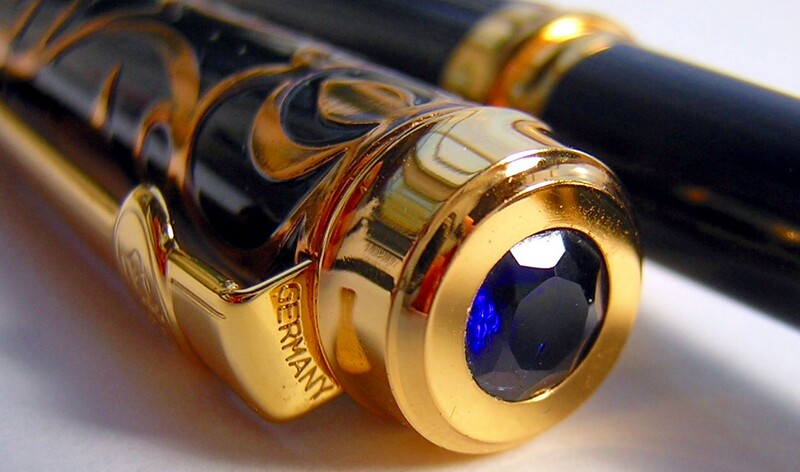 "Dear Norman: I’ve been an aficionado of fountain pens for many years now. My father, who makes his living by the mighty pen, has always been in search of the perfect (and elusive) fountain pen. Our search had taken us the way of Sheaffer, Pelikan, Parker and Cross, to name a few. Sadly, none of them quite fit the bill. Some were too heavy, others too light, still others too scratchy … the complaints abounded. When I received my Sapphire, the quest ended. 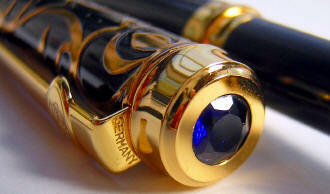 Not only is it a strikingly beautiful pen, but it writes as if by itself! It has quickly become my favourite pen and has become the object of envy by colleagues, friends and family alike. Thank you so much for providing such a lovely product, made all the better by your careful ministrations." "Hi Norman: Thanks for the gorgeous Duke Sapphire pen! I am delighted with the beautiful design, heft, and smooth delivery--all better than envisioned! My wife was initially skeptical with all the warm testimonials but when she took this pen and wrote with it... she wrote "What an exquisite pen; the nib is like glass!! I want one just like this!" I am happy to oblige, but I think another look at your other pens might still be in order. The Sapphire, though, is just beautiful! Thanks again for the pen, your note (with sealing wax! ), and your great service. You have a business that must give you much joy because you give such pleasure to others." "Hi Norman. Just received my new pens today. They are even more beautiful than the WEB images imply! Absolutely love the Uranus Butterfly model...couldn't help myself...just so whimsical! And it was in YELLOW! Love the unique finger hold shape with the three sided finger flats...brilliant. The Duke Sapphire is as expected from Duke. Fantastic feel, just right weight and a splendid job of ornate metal inlay. I am going to build myself a wall display cabinet over the winter. Realized I forget about my small (but much loved) collection because they are hidden away for safe keeping. I'll send you pictures of the finished product! Thanks for the great customer service as well. Where else do you get hand written thank you notes with wax seals on original origami folds!!! You rock!" "Good afternoon Norman. I am sorry I have not written before now about the Duke Sapphire I bought a few weeks back. Things have just been crazy here at work. 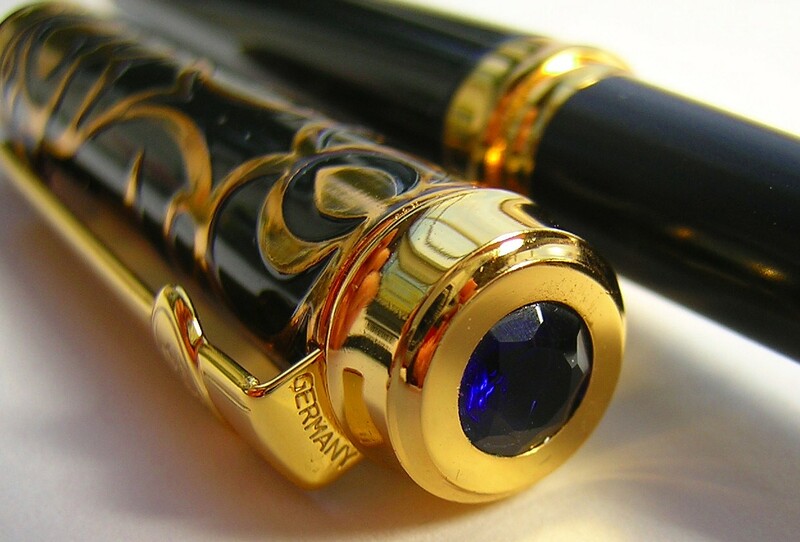 The Sapphire is a lovely pen. I have received several remarks here at work on its appearance. The gold on black makes it stick out in any room filled with engineers taking notes. But the beauty of this pen goes beyond being just skin deep. One just has to uncap this black beauty and apply it to the nearest writing material and it sails across the surface like an ice cube across a hot surface. It doesn’t matter if you are jotting down quick notes or writing a slow note showing off your penmanship, this pen does it all. The Sapphires silky smooth action has quickly secured its place as my everyday pen and gets looks every time I slip it out of my pocket and into my hand. The Sapphire is truly one of the best kept secrets of the orient. Thanks for your web site and offerings. 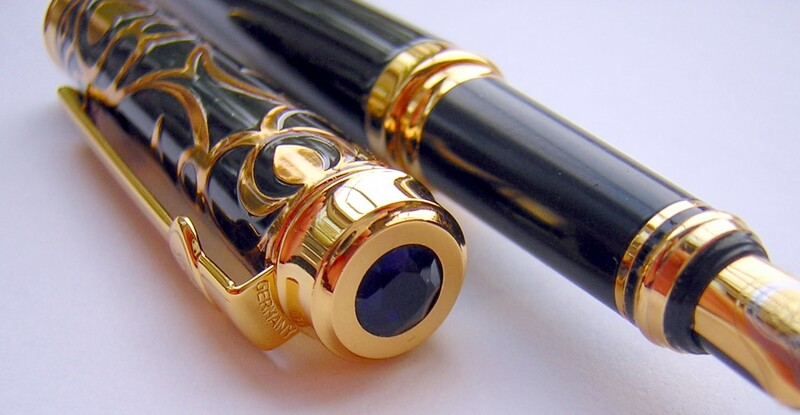 The Sapphire overlay is a lot of pen for a modest price. It has a lot going on in its design, yet the gold and black somehow still keeps it demure. The first thing that you notice when looked at in profile is of course the lovely metal tracery of the cap. 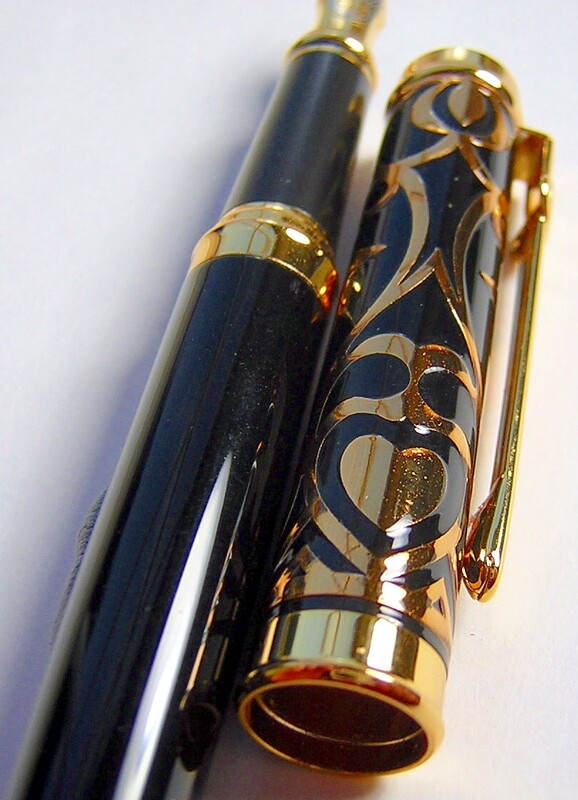 Although it appears to be a conventional overlay at first blush, upon closer examination it's as if the gold-plated design is actually embedded within the black lacquer of the pen and virtually flush with its surface. I'm choosing to call this an interlay instead . Ah yes, the sapphire. That's the other thing you readily notice about this pen, if your perspective is slightly altered. The sapphire that rests atop the cap (finally, a cap 'jewel' that really is a jewel) is subtle in appearance rather than overpowering. It's of just the right size and color to add some understated panache to the overall pen design without being gaudy. The close-up shown to the right is under direct, strong sunlight, which I wanted to use to make the sapphire readily apparent. The jewel is slightly larger in size than that used in the Ruby model. The pen measures a full-sized 5-1/2" capped and a bit over 6" posted. The clip bears the DUKE 'crown' logo. The cap is of the 'slip cap' variety, and re-seats with a secure 'snap'. The lovely steel tow-toned spear-point nib is plated with 22K gold and platinum, and like most DUKE nibs produces a line between a western fine and medium, or what I term a light-medium. The pen has a nicely textured section, affording a sure and comfortable grip while writing. Unscrewing the all-metal fittings between the section and body reveals the large-capacity piston for bottled ink.